Supreme Leader of The Satirical Party, Armando Ianucci, switches focus historically and geographically for his latest. The patent inanities of TV hits The Day Today, The Thick Of It and Veep have perhaps been superseded by the real-life ridiculousness of the day …today. A post-Brexit backbiting stalemate and Trump’s disunited States, together, might have taken us into such a nonsensical era that parody becomes impotent. Attention is rewound instead to the Soviet Union in the post-World War II aftermath of Stalin karking it. Paddy Considine conducts a fine opening overture. He’s a radio producer broadcasting an orchestral recital with celebrated pianist Maria Yudina. Afterwards he receives a phone call from General Secretary Stalin himself, who expects a recording of the performance straight away. Except it wasn’t being taped. And everyone’s gone home. On pain of execution, Considine’s Andryev must recruit the nearest conductor, musicians and audience (not to mention persuade an indifferent star performer) to record an exact facsimile of the evening. It’s an exquisitely funny scene, neatly setting up the irreverent and anarchic tone. It might also form the film’s high point. Stalin’s own blustery belligerence is a comic joy from the start, courtesy of Adrian McLoughlin. It’s much heightened by the decision to give him an East End cockney sparrer accent. A bit like Alan Sugar with the massive military arsenal to actually deliver on “You’re fired”. But he’s soon brown bread himself, climbing the apples ‘n’ pears to the afterlife. As soon as he keels over, the associates who do his bidding begin jostling for position in the political vacuum left in his wake. Of course they could call a doctor …but in a minute. Principal schemer is Simon Russell Beale. He provides the dark plotting heart of the piece, giving a superbly snide performance that entrances and appals in equal measure. As primary puppetmaster of this black sea comedy, you wonder why he’s conspicuously absent from the movie’s poster. Maybe such a strong cast means that took just as much jostling for position by the actors’ agents. It’s certainly a true ensemble work. Steve Buscemi excels as the despairing Khrushchev, while Jeffrey Tambor is perfect for the out-of-depth deputy filling the departed’s soiled shoes. Andrea Riseborough injects the otherwise glossed-over hysteria as Stalin’s fraught daughter, and it’s a delight to see Michael Palin back in an outright comedic role, his doddery manner finely becoming the impressionable old soak Molotov. Turning up arrogantly late to the party, Jason Isaac’s bully-boy Minister for Defence is a hilarious turn, complete with his own preposterous regional drawl. His broadsides are broadcast in broadest West Yorkshire. Yet this is not a Muscovite In The Loop (2009). Gentler, yes, darker, perhaps, but it never quite reaches the same intensity of fever pitch stupidity. It may thus prove a touch disappointing, but only in comparison to the writer-director’s supreme pedigree. What it does do is delicately and intriguingly blur the line between farcical fiction and fact. And it can’t help but provide a bizarre but timely context within which to reframe the current administration’s apparent absurdities. Indeed, as usual with Ianucci, it extends to a comment on the immaturity of the squabbling at the core of all politics. 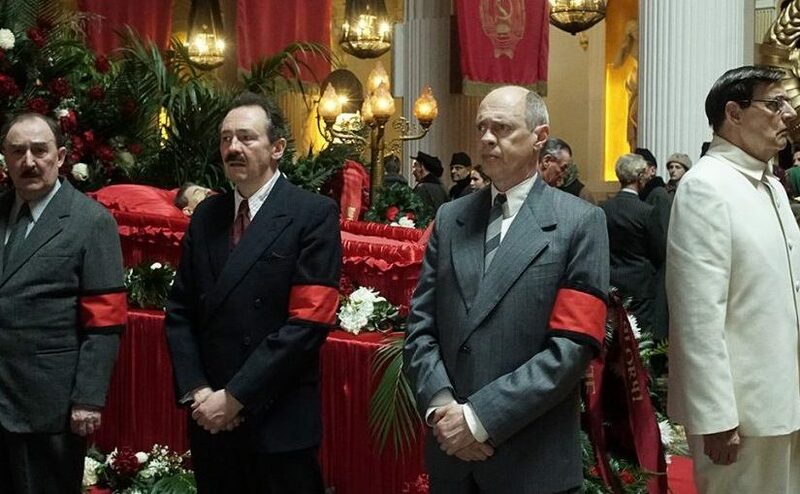 The Death of Stalin is a commendable communist comedy of Machiavellian Marxists. And it’s an enjoyable widening of an exemplary satirist’s targets. But it is not quite the world-dominating humour superpower we might have been expecting.